It’s that time of year again! 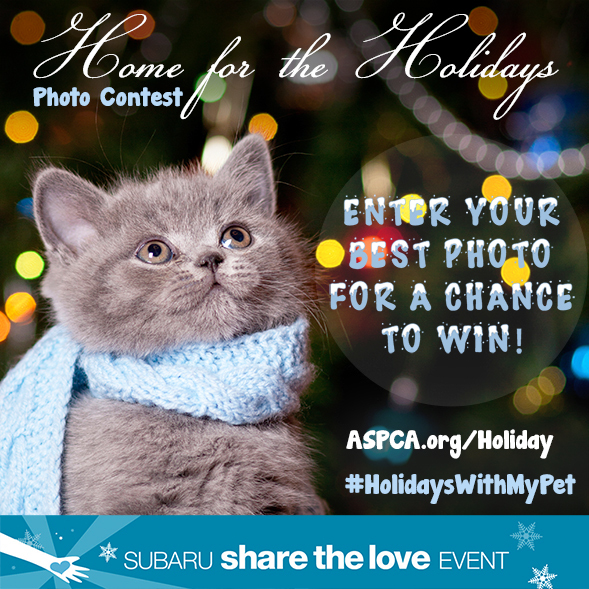 As part of the Subaru “Share the Love” Event, we’re hosting our annual Home for the Holidays photo contest to celebrate rescued pets and the people who gave them a second chance—and a loving home. We hope you’ll join in the fun by sharing a festive photo of your pets enjoying the holidays on Instagram or Twitter using the hashtag #HolidaysWithMyPet. Make sure to tell us what makes sharing the holidays with your furry friend so great. No more than one photo will be accepted, so take your best shot! Be sure to tell all your friends—the top three photos will receive a special ASPCA Holiday Gift Pack. One grand prize winner will also receive $200 worth of Subaru pet travel gear! To find out how to enter and to learn more, visit the Home for the Holidays contest page.